Many of us know retired police officers who remember a world where it was considered a failure to draw a weapon unless under direct attack. Even if such an action was required, the result was nightmare inducing. Today's police seem to have lost such empathy. 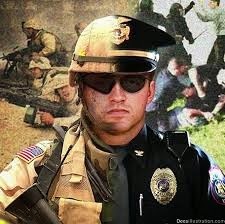 As a consequence, police are rarely a welcome sight these days; they are being equipped and trained as if they are an occupying force (even in small towns), replete with body armor, tactical gear, and vehicles coming straight from the US military at bargain prices.